Forest certification is a voluntary third-party process that identifies and recognizes well-managed forest land. It takes into consideration the ecological, economic, and social components of forests and surrounding communities. Through chain-of-custody certification, fiber from certified forestland can move through production streams, thus enabling the end product to receive a certified logo informing customers that the product came from a certified, well-managed forest and was manufactured responsibly. There are two major internationally recognized forest certification systems for public land: Forest Stewardship Council® (FSC) and the Sustainable Forestry Initiative®(SFI) . To become certified or maintain certification, certificate holders must successfully undergo annual audits, conducted by independent, accredited auditing firms. 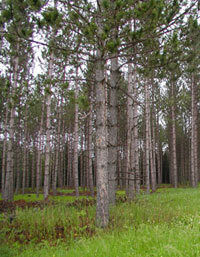 In 1997, Minnesota DNR and Aitkin County obtained third-party forest certification for about 370,000 acres of forest lands. These were the first public forest lands to be certified in the United States, thereby establishing DNR and Aitkin County as nation-wide leaders in forest certification. In 2005, DNR obtained dual (FSC and SFI) certification of 4.5 million acres, covering all state forests and most wildlife management areas. In December, 2010, DNR's Forest Certification program grew to 4.96 million acres, covering 90 percent of the total *5.53 million acres managed by DNR. Today, DNR is the largest single FSC-certified land manager in the U.S. Maintaining forest certification is a sign of DNR's dedication to sustainable and responsible forest management. It provides DNR and Minnesota citizens with many additional benefits.